Mexicans use March 17th to honor the San Patricios. These Irish immigrants to the U.S. were drafted into the army and sent to fight in the Mexican-American War (1846-48). Dismayed at fighting fellow Catholics and suffering from mistreatment by their Protestant commanders, hundreds of the Irish soldiers deserted to the “enemy” and formed the San Patricio Brigade of the Mexican Army. Dozens were killed in battle, and many more were captured and executed as deserters by the Americans. The Mexicans remember them fondly as “The Irish Martyrs” and as heroes. There is a late afternoon parade that ends at the Parroquia . 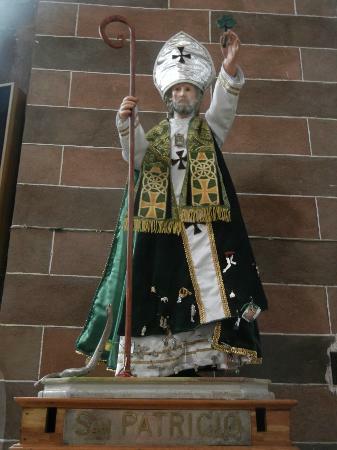 Throughout the day people visit the St. Patrick statue in the Parroquia to place milagros (miracles) on his clothing to invite his intercession on specific causes.